So if you guys have been reading other nail blogs, you've probably heard about the Nail Files, a reality TV show about Katie Cazorla and her nail salon, The Painted Nail. Katie is absolutely crazy. And she's totally hilarious. But I don't think I could watch more than one episode. Putting together Canada's Sports Hall of Fame was the most stressful project I've ever undertaken. It was so stressful that I felt sick just about everyday for months. It always seemed like whatever could go wrong always went wrong. I was reminded of this while watching the Nail Files. I couldn't take the stress and drama. Also, I don't watch TV, so this was like jumping into crazy with no buffer. I also watched it with StBFF and her boyfriend. StBFF wished there was more content on how she developed colours and just general nail polish content. I agree with her. But SfBFF's BF was like yeah, it's pretty good. The full spectrum here. Hahaha. Now onto the nail polish. 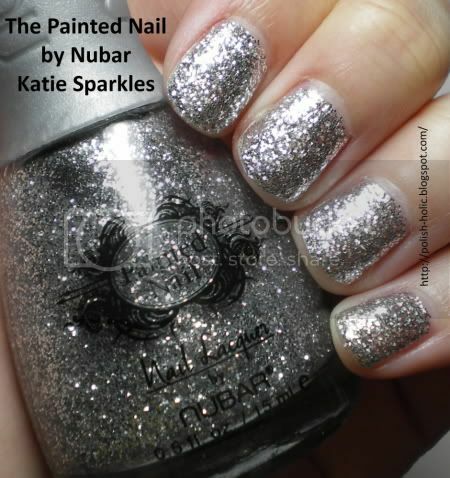 The Painted Nail by Nubar Katie Sparkles. Dude, silver glitter bomb. Holy cow the bling-age. Medium sized silver glitter in a clear base. Three coats no topcoat. This is pretty packed with glitter. I would say you could have even gotten away with just two thick coats. But I had a couple annoying bald patches so I decided on a third. Next up is my favourite. The Painted Nail by Nubar Mestiza. A gorgeous acid yellow foil. I know the words acid yellow and gorgeous probably don't fit in the same sentence, but they totally do here. Yellow is one of my favourite colours. Second only to green. I go on at length about my love for yellow here if you're interested on hearing my opinion on the subject. Lol. But anyway, Mestiza has a bit of a lime green flash to it which lends to the acidness. Omg, I love it. If only I could pull off this colour. This colour was named by Vanessa Hudgens, I believe. Three coats with topcoat. I would say again, probably good at two but I used three just to see if the colour would be more intense. I don't think it got anymore intense, but the third coat covered up my VNL a little bit more. Samples and the first episode of Nail Files were sent to me for review by the PR company. Pic of the Moment: WARNING. 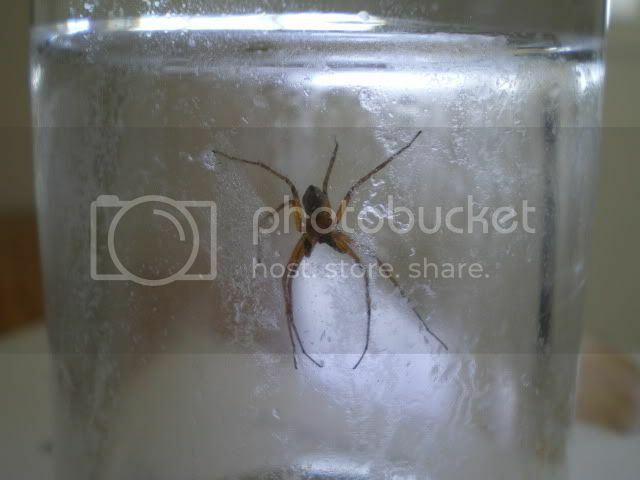 IMAGE OF SPIDER BELOW. My policy with spiders is based on the idea, "the enemy of my enemy is my friend." They help me in my war with mosquitoes, therefore they are good people. So when I find a spider, it's all about the catch and release. As long as I don't see them in my home, I'm totally a-ok with them. I caught this bugger a couple weeks ago. Usually I keep an old candle holder and postcard on hand for situations such as this. He was a fast little thing. Beautiful spider! And he almost matches the Mestiza! I love the silver Nubar shade, so pretty. Yup, I let the little guy go outside.